Cats are designed to eat small portions of food through-out the day. This is what feral cats naturally do in the wild and, as long as portions are not massive, your cat will love to eat small and frequent rather than two massive meals AM and PM with nothing in the middle. Leaving free food out to eat all day leads to a cat becoming fatter than it should as some cats will continue to eat far beyond what is necessary. Research into cat feeding habits. What wild cat eats all day long anyhow? This is where the Review of Eatwell™ 5 Meal Pet Feeder from PetSafe® Brand comes in very handy! I was sent several feeders to review and couldn’t wait to test them out with my two Norwegian Forest cats who love eating! The first thing of note was how large the feeders are. This is good as it means the feeding trays are of a good size and able to accommodate the faces of larger breed cats such as mine. The timer requires batteries only and cannot be plugged into electricity yet. This may change for the future. Many pet food timers require a per owner to have a PDH just to work out how to programme them so I was really glad when the easy to follow instructions were just that – EASY! I was able to programme 5 feeding times within a 24 hour period with limited fuss and effort. Once programmed the timer continues on the same cycle everyday and just needs the trays filled with your pets fav food. Filling the trays with a small amount of biscuits ensures your cat can eat small regular tops ups alongside their usual meat breakfast and dinner. Cats are obligate carnivores meaning they need nutrients from meat muscle to survive. I am not a huge advocate of a dry kibble diet but a small amount per day can compliment their main wet food meals. It would have been nice for this feeder to have an ice tray so that wet food can be used but, as I found out, the wet food begins to smell when left too long in the trays. Perhaps the designers of the Eatwell 5 meal timer can look into this for the future. At the moment I would advise kibble only is used in them. Next we have the sound of the timer. Although the feeder does not make a sound in general it does make a sound when the tray rotates to show the next tray of food. The sound is a little harsh and did make my cats jump first time around. However, after the first day they soon linked the sound to food and came running as soon as they heard the tray rotating to the next open slot. The round tray pulls out from it’s case ensuring that the cleaning of it can be done with ease. That is another plus for sure. Behaviour issues: Since using the trays my cats no longer cry constantly for food. Small regular kibble breaks means their needs are bing fulfilled without over feeding or waiting too long between meals. Sometimes my cats are sitting outside or are asleep when the feeding tray moves to the next slot. It’s cool if they do not rush to eat as the tray stays open in that slot until the next time it rotates. However, if they are feeling peckish they have the choice. Do not over fill the trays though like the photo below!!! There’s anough food in this timer to last a year! Do not overfill the trays. A tablespoon of kibble per tray should be enough per cat. Get two feeders for two cats. So, what is my conclusion on the Review of the Eatwell 5 Meal Pet Feeder from PetSafe® Brand. One word. FANTASTIC!! My cats are happy and I am happy with the product. 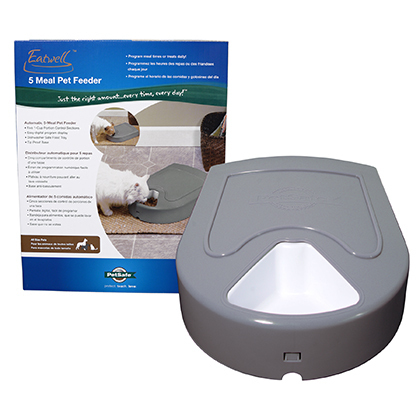 All major pet product outlets online sell the Eatwell™ 5 Meal Pet Feeder from PetSafe® Brand so buy yours today. You won’t be disappointed.